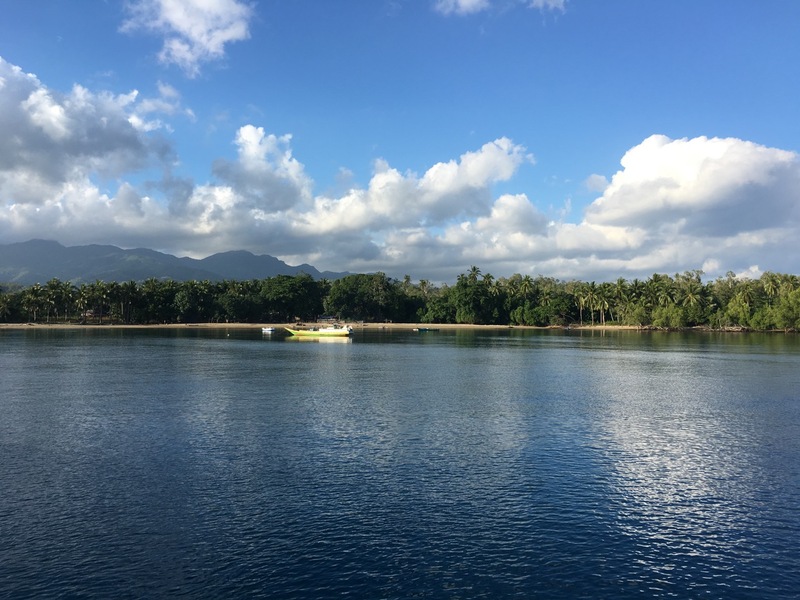 If someone said, “visiting a remote tropical island,” what images might that conjure up for you? Palm trees on a deserted white sand beach? Loinclothed men with matted hair and spears in dugout canoes? 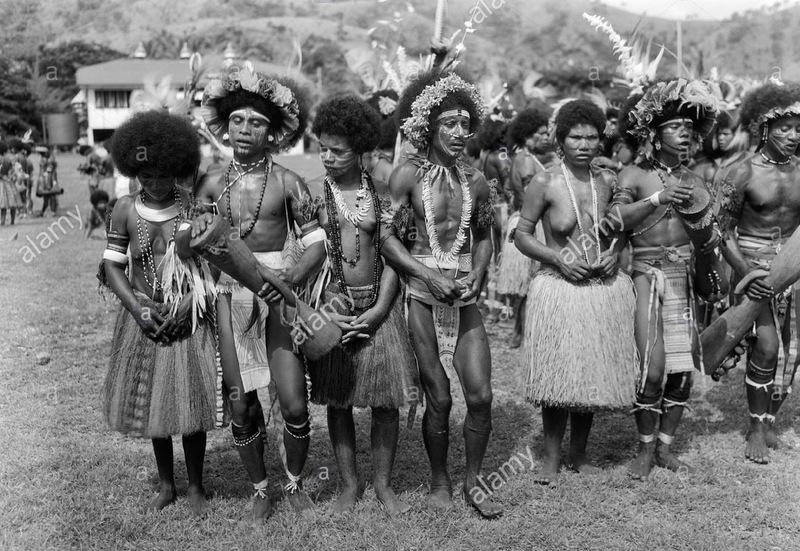 Bare-chested women with grass skirts, barefoot, standing in front of a bamboo and grass-thatched dwelling? A roaring fire on the beach, a whole wild boar on a spit, turning slowly to the rhythmic beat of hand drumming? 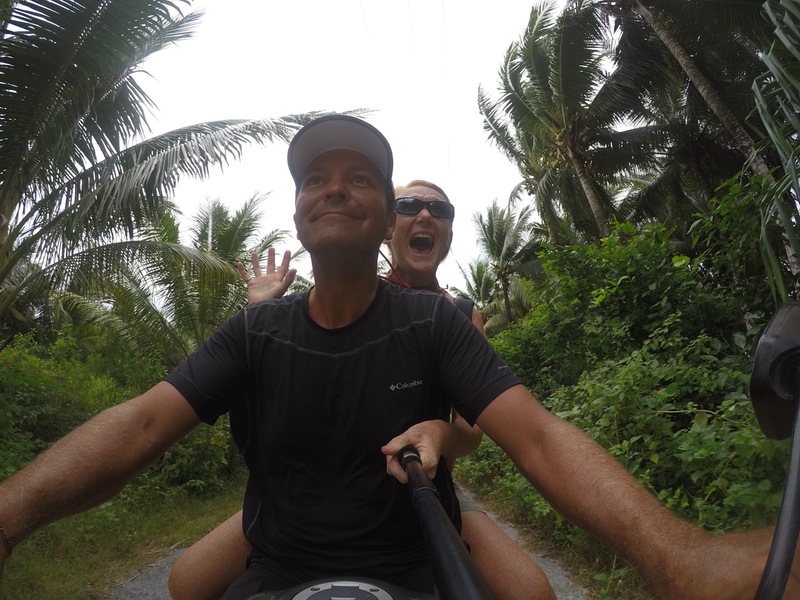 As we approached Pulau Babar, we had only the slightest idea of what we were in for. When we arrived, we were tired. We had done three 11 hour hops and then a 30 hour crossing that was particularly bumpy and hard-going. 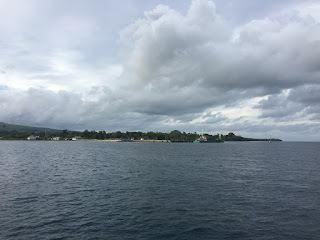 We rounded Pulau Wetan and had the fishing village of Tepa in sight. It was a somewhat sheltered bay, comprised of a village of thirty-five or forty decrepit-looking concrete and tin-roofed buildings and a substantial concrete jetty that went well out into the bay. 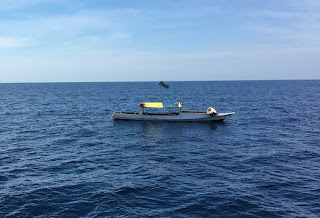 We dropped anchor by noon and managed to secure the boat, put up the sun cover and establish that Popeye’s anchor was securely dug in and we could finally rest. We were salt-covered, sleep-deprived and completely over dealing with anything except our pillows. And then they came. 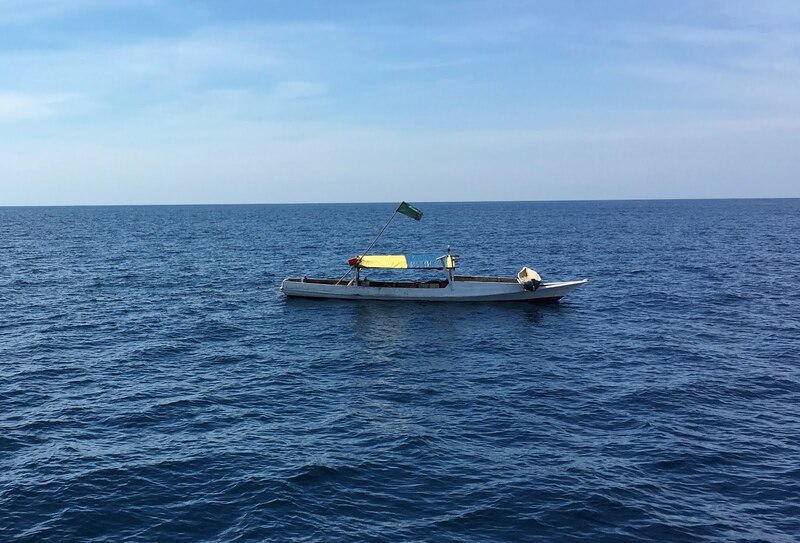 A outrigged canoe containing Aristotle, Andy and the non-English-speaking fisherman that owned the boat came chugging up from the shore. Aristotle, a slight, intense-looking man in his early forties, wearing ripped jeans and a years-old t-shirt and Andy, a short, sixty-ish unhealthy-looking fellow with a bad cough in an unkempt collared shirt and dirty dress pants (identifying himself as the local protestant priest) were the spokesmen. Their driver, a tired-beyond-his-years forty-ish fellow, was unremarkable in an old t-shirt and shorts. All three men were short with thick, dark hair and complexions. The trio insisted on coming aboard to welcome us to their village. Tired as we were, we didn’t want to be rude so we acquiesced and allowed them to board Popeye. We offered water (cautiously avoiding offering alcohol, not knowing the local customs or taboos) and tried to make them feel welcome. 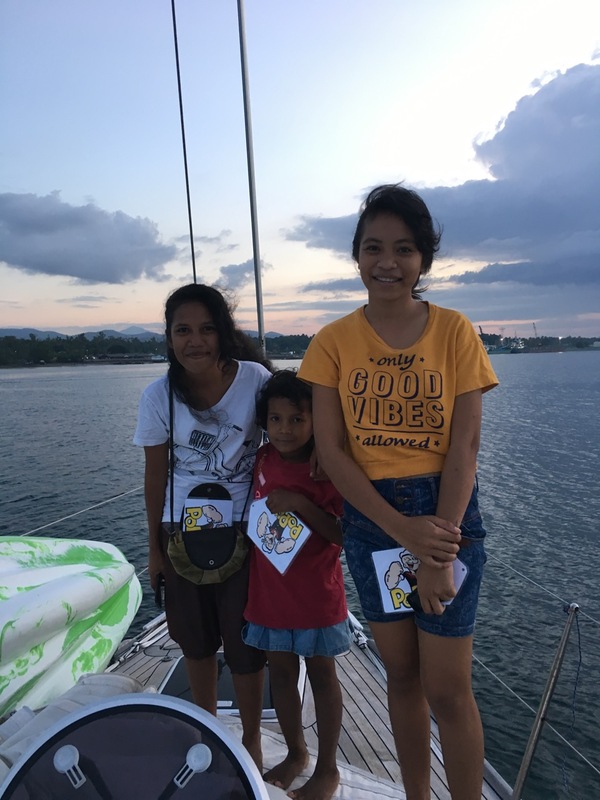 Aristotle’s main goal was to get us to agree to have him be our ‘guide’, even though we had not yet mentioned going ashore. 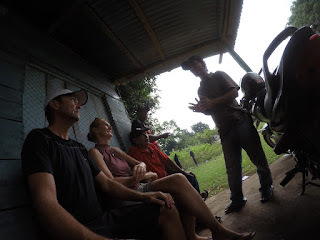 He informed us that he could take copies of each of our passports and give them to the chief of police, the harbourmaster, the army captain and the head of the village. He advised us that cash bribes were not necessary for these officials, but cigarettes would be a good idea. Also, we would be interested in a tour of the island, yes? How many days? Kate was keen to see some of this remote island (keep in mind we had NO IDEA what we would be seeing or whether there would even be roads outside of the village) so I suggested that a one day tour would be interesting. Aristotle needed a price to be established, right now, so we would know what we were paying. “Tell me a price, what do you think is fair?” he asked. 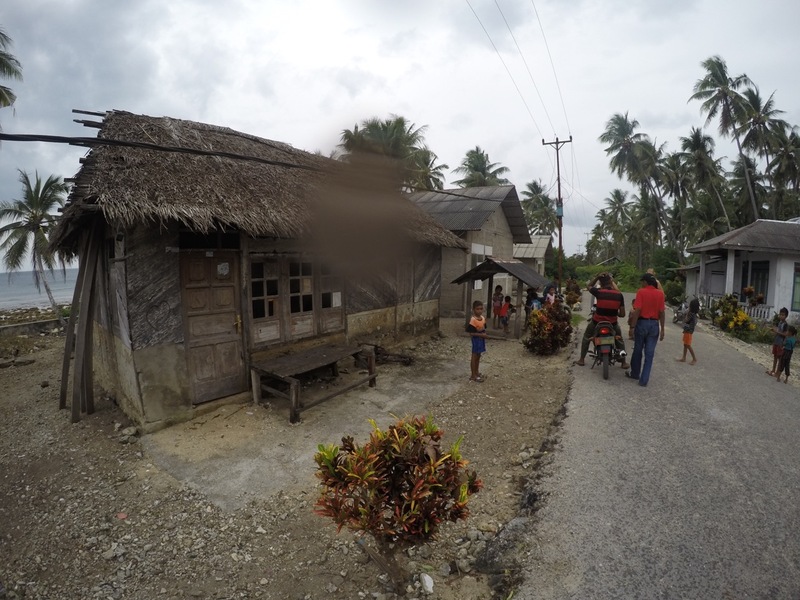 Having no starting point, I threw out 200,000 rupiah (double the daily wage of a labourer) for a tour. “Oh, not enough,” he told me. “400,000 rupiah?” I offered, reluctantly. “This is a full tour, with Andy and myself guiding.” he replied. I told him that we didn’t have much money, as we were at the end of our journey, on our way to Australia and didn’t have much money left. Perhaps just a half-day tour would do. 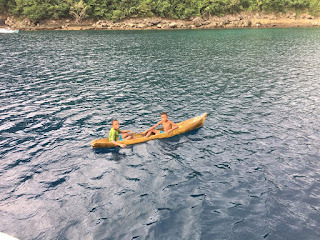 “Well, OK, we can go to the next village where they make coconut gin, then to a primitive fishing village, then to a waterfall. 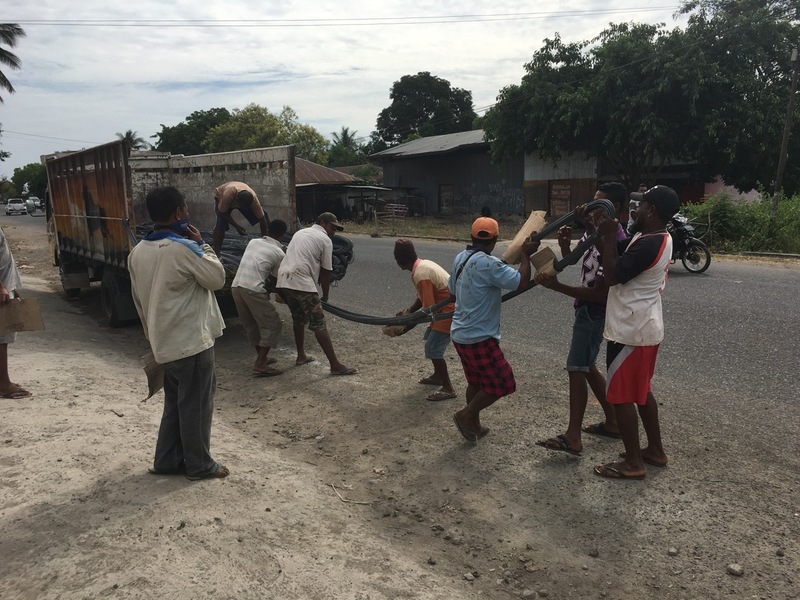 Please bring money for water and snacks for all of us, fuel for the motorbikes, gifts for the head of the village, …” he replied. 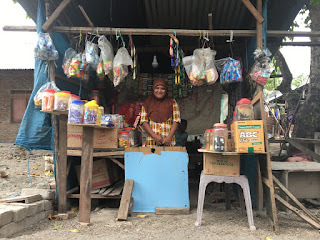 “Can I just give you 600,000 rupiah and have you pay all of that?” I finally offered. He seemed satisfied with this and so packed up his contingent and left us in peace. At 9:30 am, we were instructed to be on shore. As soon as they left, Kate and I dropped in a heap and slept until dawn the next morning. Sean, hoping he can remember how to do this. We woke to an overcast sky, but were in better spirits at having had some (15+ hours) of much-needed sleep. 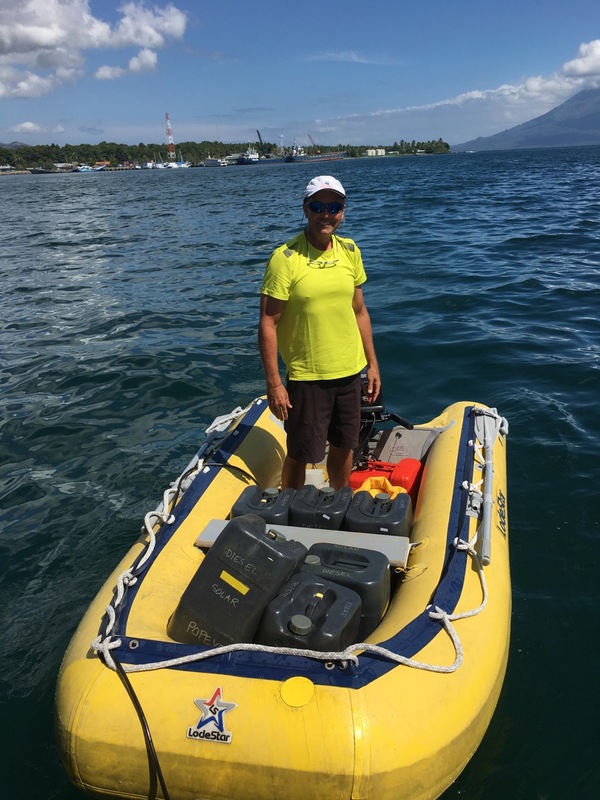 We inflated our dinghy and headed to shore. We found that a new addition to the tour was Dewan, a member of the Indonesian army that was stationed on Babar. He had brought a brand new, army-issued Yamaha motorbike, not a scooter, for me to ride. "Are you OK with this?" I was asked. With bravado I said that would be fine, even though I hadn’t ridden a motorbike with a clutch and three-up-one-down gears for decades. How hard could it be? 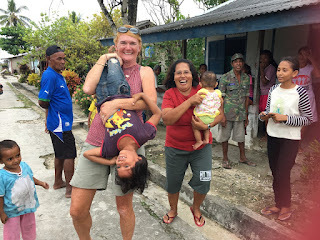 Kate climbed on the back, both of us helmet-less and in flip-flops and followed our guides along the broken asphalt-and-gravel road to the next village. When we arrived in the next village, we were taken straight to the home of the local bootlegger. The gin distillery was in full operation at 10 am and it was insisted we try the local brew. By now, a crowd of locals had formed, including kiddies, oldies and everyone in between that could walk, limp or hobble over to see the white-skinned tourists in their village. First stop on the tour ... gin distillery on the left. “It is tradition that each of us drink, and say ‘Kalweydo’ as a toast,” Aristotle informed us. 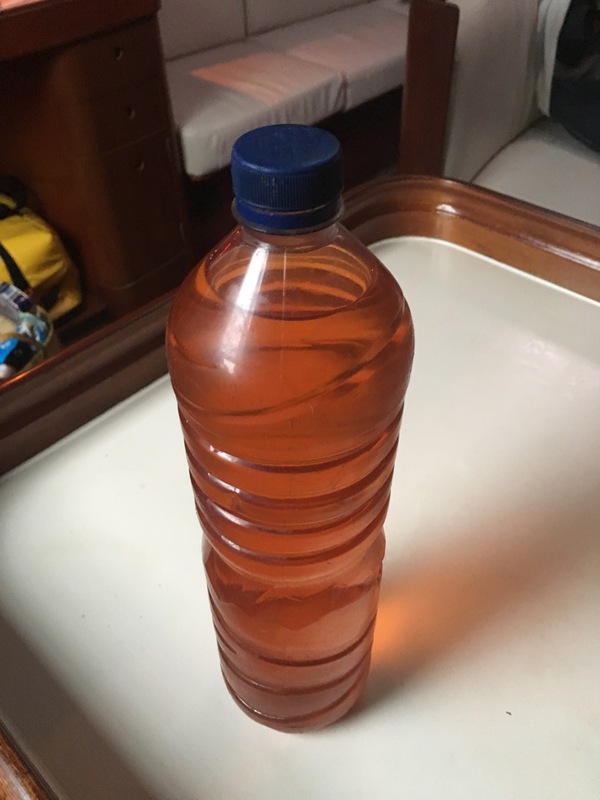 A recycled water bottle containing a rosé-coloured liquid was produced - the local coconut gin. So we politely drank, and then offered a small gift to the head of the village. This made everyone happy, so we had to have another drink. 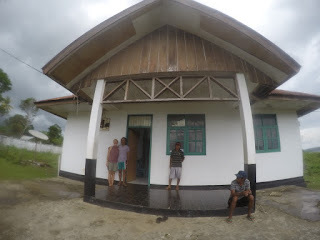 Next, we had to see the new communal house in the village, where dinner would be prepared for the whole village/family and everyone was welcome. We all got up (the whole village that had assembled) and walked over to inspect the structure in the process of being built. This called for a drink, so suddenly another recycled water bottle was produced. Kalweydo sounded a few more times before we were allowed to move on. One of the many glasses of gin I had before noon. Perhaps the primitive fishing village was a bit far away. Would we like another drink instead? It was maybe 11 am, but the stuff they gave us was becoming quite drinkable, so yes, we would have another glass. Kalweydo! Next thing we remember, we somehow piloted ourselves to the village that our boat was anchored off, at someone’s home, with bad Indonesian karaoke being pumped into the street on a massive stereo system. We were offered dinner, which Kate and I are pretty sure was dog. We thought they said “duck” but it didn’t taste or look anything like duck. It was spicy and done in a redang sauce. I ate a bit but found our hosts tossing the chopped-up bones out of their served dishes, off the porch and into the gutter. Kate and I quickly cottoned onto this and tossed the remainder of our meat out, bit by bit, and ate just the rice. All eyes were upon us and we were reminded by Aristotle we were expected to be polite. This must have happened because there is a picture of it. The song “Una Poloma Blanca” came on the karaoke at some point and hearing a recognized song (and a lot of gin and Kalweydos) encouraged me to dance. The group thought this was a marvellous idea, so the song was set to infinitely repeat and we took to the street in front of our guest’s home. Kate was dragged out of her chair by the army captain, but quickly got into the spirit of the song. It rained, scooters and motorbikes came by to look at the tourists, we danced, we sang, we hugged and shook hands with everybody, and even our guest’s dad, who didn’t normally drink, joined us for gin and Kalweydos. 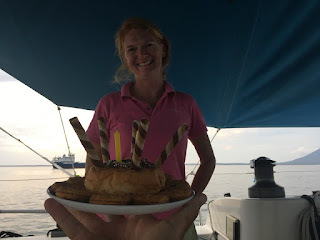 At some point, we were allowed to politely leave and Kate and I managed to make it back to Popeye without sinking the dinghy, drowning or losing our possessions in the bay. I believe divine intervention and the dry bag were a big part of that, though. Thus ended Day Two. Tired and hung over, we awoke the next morning to calls from the stern of Popeye. The next three days were filled with visitors to the boat. We had some jobs to do. We needed to refuel. 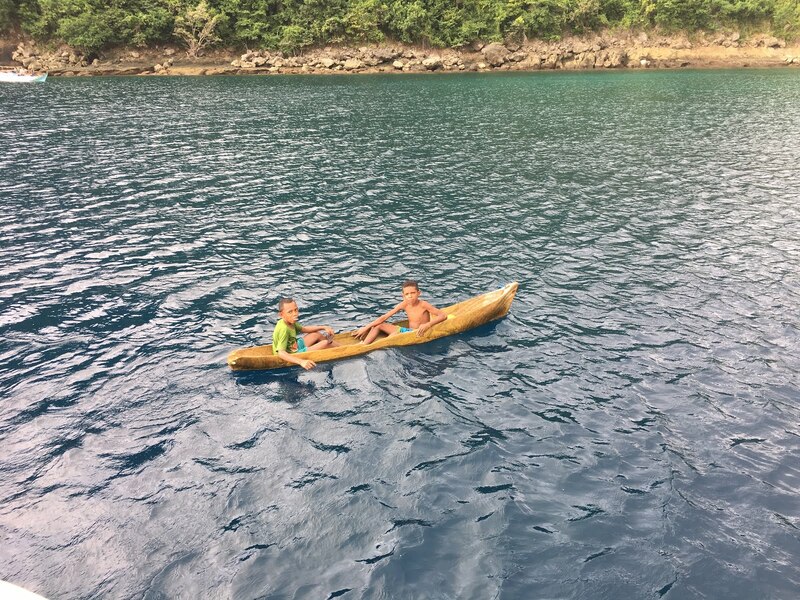 We needed to fix a leak in the dinghy that had happened when we left such an exotic dinghy on shore - an irresistible plaything to all the village children. We wanted to hand-wash and dry some laundry. We wanted to clean up the boat and prepare for the next big 24+ hour crossing to Saumlaki. And still, the visiting canoes kept coming. We did our best to be gracious, but I found myself getting quite perturbed at the constant stream of visitors and demands on our time. By couldn’t they respect our private space? My answer came on the last day. 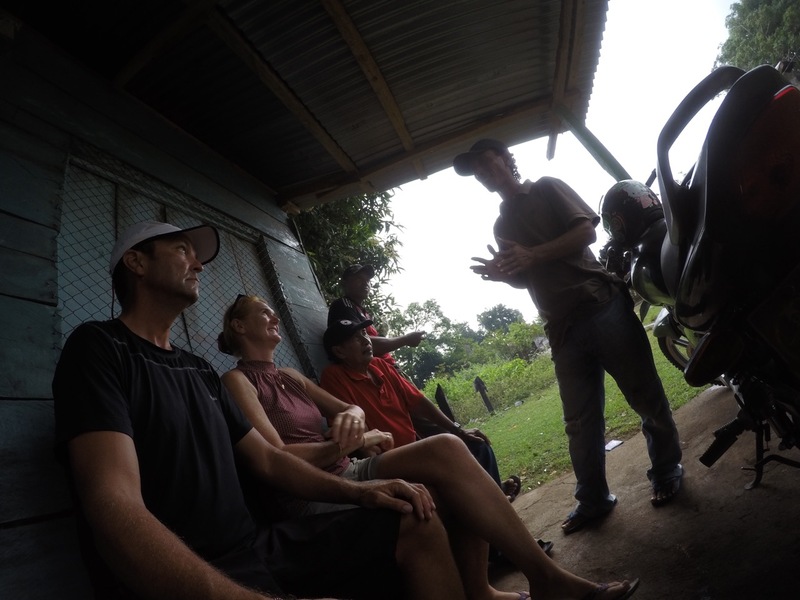 One of our army visitors, who spoke very good English, mentioned that he never expected to be able to travel outside of Indonesia. 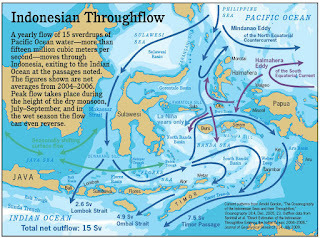 Their currency, th rupiah, was greatly devalued, making it completely out of reach of 99% of their population to go to any other country. 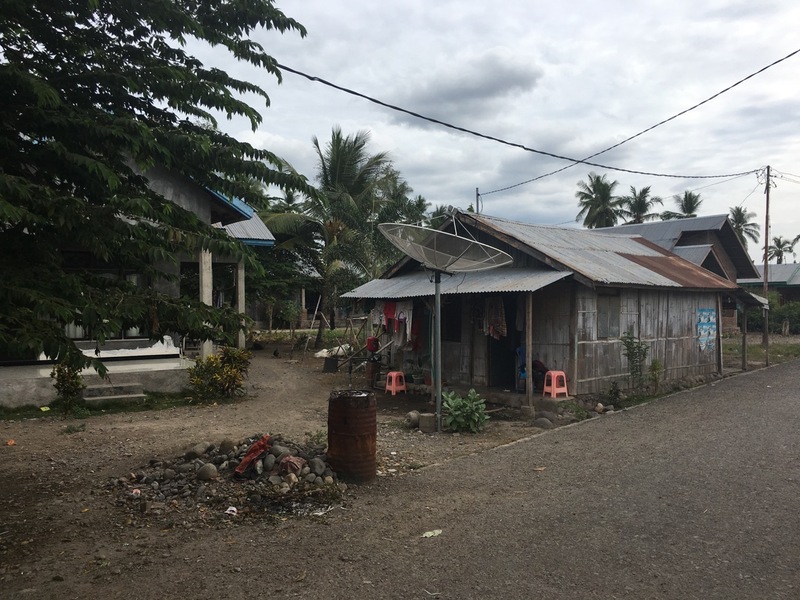 On top of that, Indonesians travelling abroad have to prove their wealth in order to not be at risk (to the country they visit) of staying as an economic refugee. 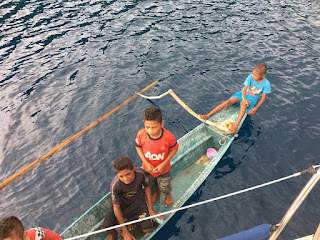 Our coming to their village could be the ONLY chance they would have to see what our lives held; see a real sailboat; practice English with a native English-speaker. When we left, there was no way that they could follow. Realizing this certainly humbled me. 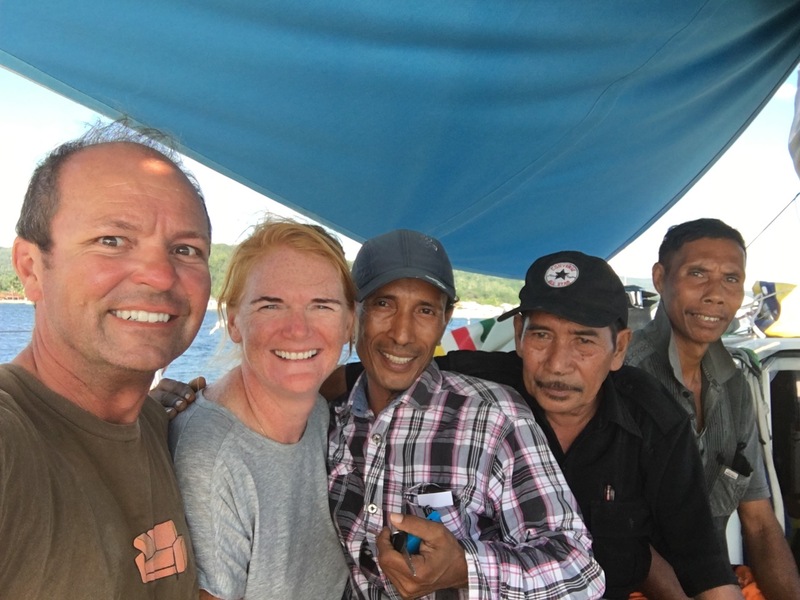 Tomorrow, we are off to Saumlaki, last stop in Indonesian waters. We meet Craig, owner of Popeye, and he will accompany us on the past big push to Thursday Island and Australia. Imagine this for 30 hours. The road from the jetty to the main part of Tepa. Sean's Job: Watch the road. Kate's Job: Fear for our lives. 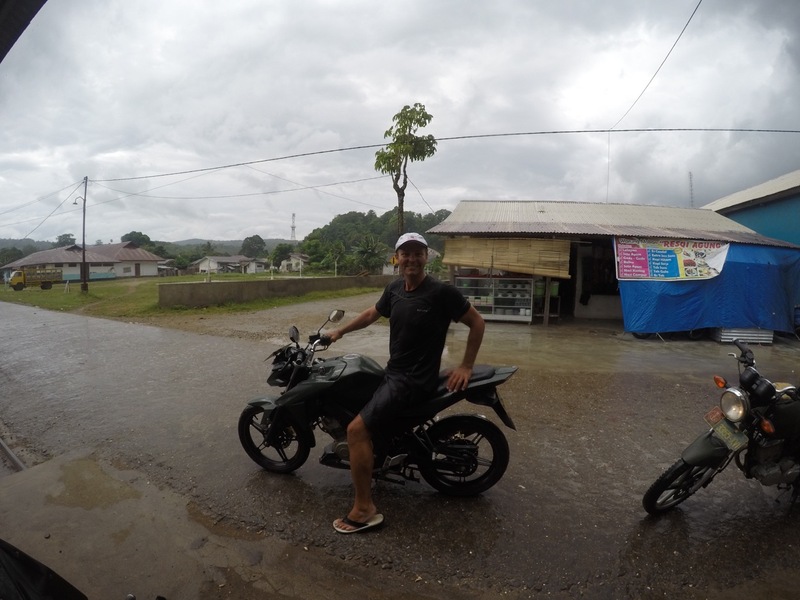 Arriving in Eletiara by motorbike. The kiddies loved Kate. She loved them back. 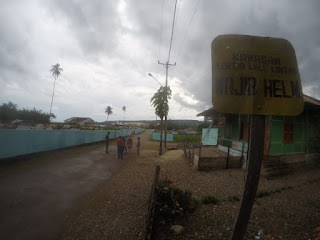 The whole village of Eletiara. entertains us in their sitting room. Hiding from a cloudburst under someone's front veranda. Coconut gin in a takeaway bottle. 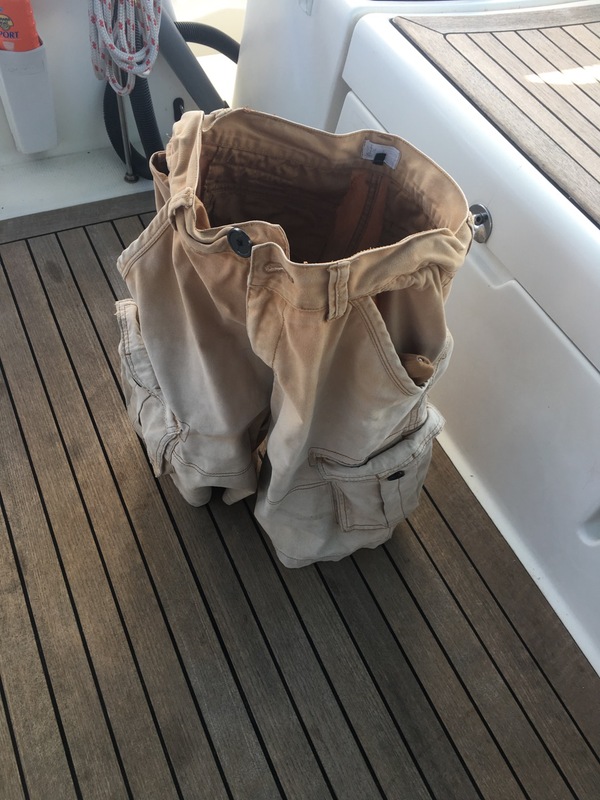 Time for Sean to wash his shorts. 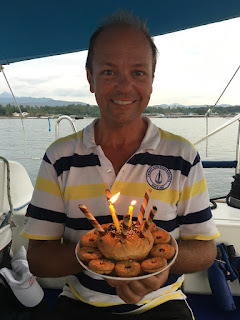 What a magical anchorage! White sand beaches, palm trees and best of all, a ‘flat’ bay. The waters here are very deep. Up to several thousand metres deep. And often the anchorages rise very steeply so we drop the anchor in 20m and as Popeye swings, we see depths from 50m to 5m. It often feels like we are bivouacked, clinging to the edge of a cliff with our fingers crossed. This wonderful anchorage rises sharply then the bay opens up and gently rises from 30m to the beach over several hundred metres. 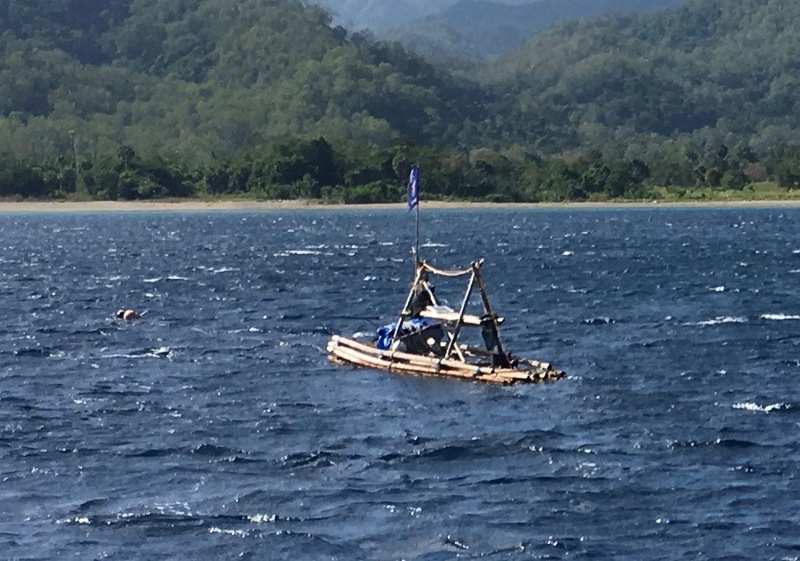 We dropped the anchor in 10m and, other than tide, we saw little deviation from this. Onshore was a tiny village. Water buffalo and goats combed the beach and the sounds of children laughing floated across the water. The stars were brilliant with two solitary lights in the village (and our anchor light) being the only light pollution. And quiet. Despite the 25kn katabatic bullets coming over the hills, we slept extremely soundly. Is it a boat? Is it a channel marker? No, it is a Fish Attracting Device. Unlit and invisible at night. 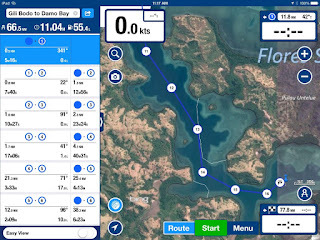 That's why daysailing is recommended through Indonesia. 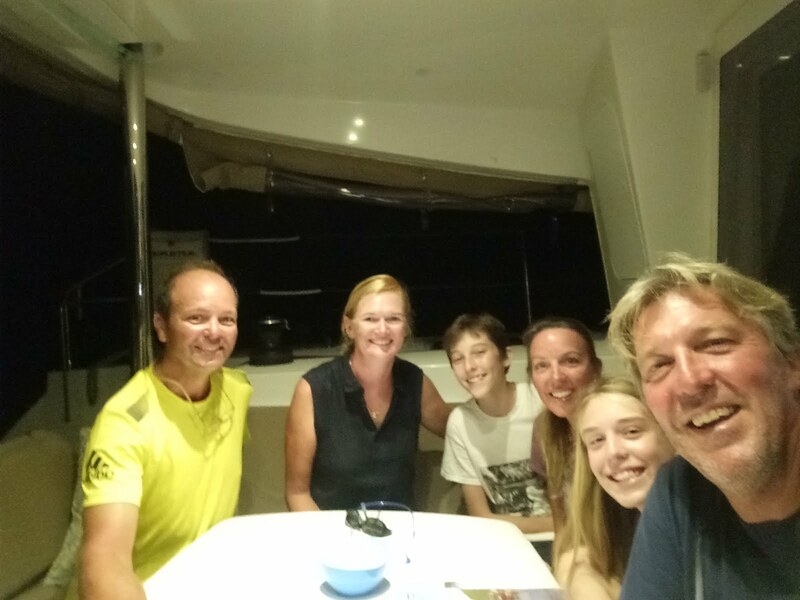 After such a fabulous evening with the Running’s crew, we were quite sad to head off in different directions (we were even sadder when Cool Runnings emailed us to say they had met up with Eric and Brigitta on Ariel IV and were timing their departures to leave for Africa together!). 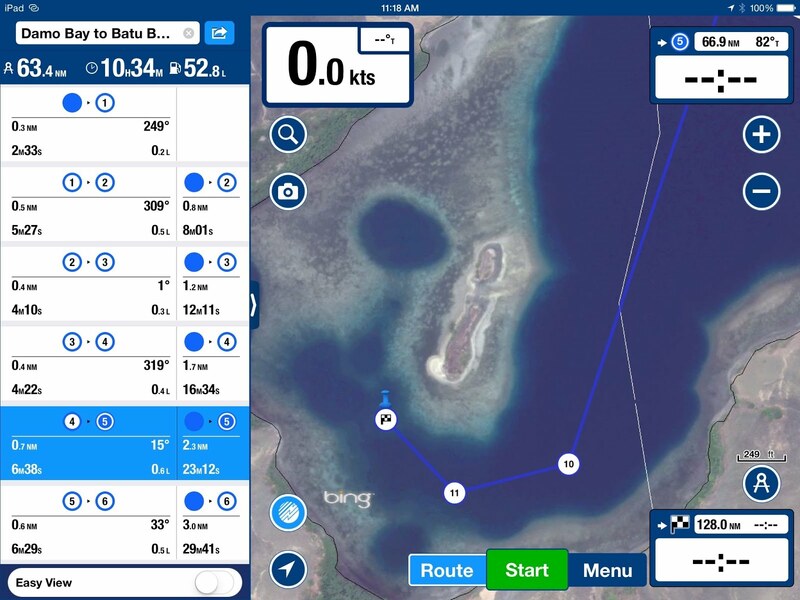 We bashed our way into a big swell, stayed well clear of Kroko Atoll and entered to Boling Strait. We have deliberately stayed to the north of islands as we have worked our way across from Bali so this was our first real taste of the Indonesian Throughflow. We found ourselves screaming down at 10.5 kn, which meant we were helped along by at least 4 kn of current. And this strait is one of the mild ones! We rounded the headland and bashed across the shallow Leba Leba Bay into a head wind. 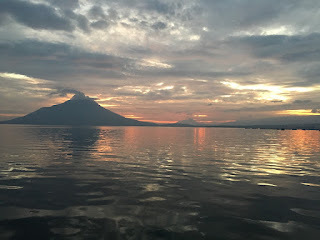 Tucking inside Awalolong Reef, we anchored under two smoking volcanoes. One in the east to complement our sunrises and one to the west for the sunset! A beautifully calm anchorage at night, a gentle breeze and the southern stars sparkling overhead, so we slept on deck. 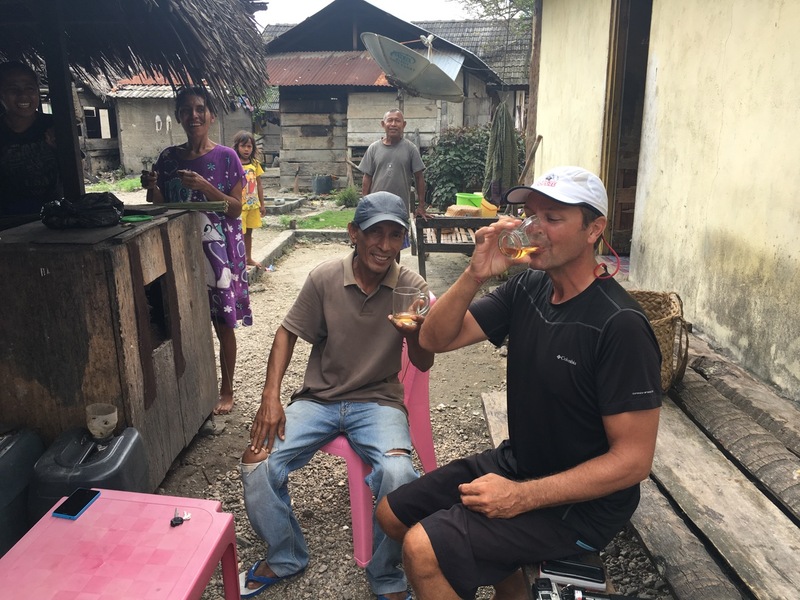 In describing Indonesia, Sean uses the adjective “homemade”; I would use “noisy”. 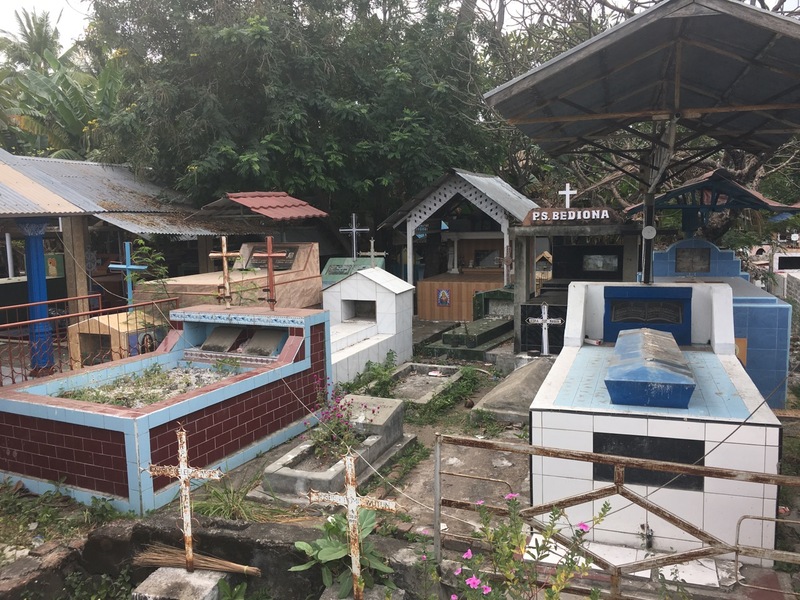 Be it the wonderfully melodic call-to-prayer, the fishing boats/motorbikes/cars that defy the concept of a muffler, the national obsession for karaoke, the roosters crowing, the endless construction noises, Indonesia is not a quiet nation. And Lewoban was no exception. 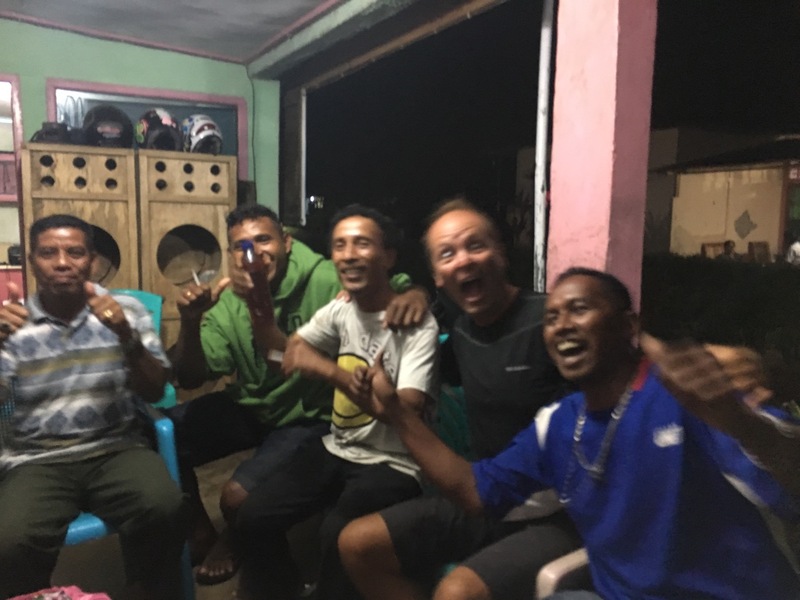 The karaoke finished around the time of the pre-dawn call-to-prayer after which the fishing boats headed out, passing very close to Popeye out of curiosity. As a consequence, we saw some beautiful sunrises and sunsets! One of the motivations for stopping in Lewoban was to hike up one of the smoking volcanoes. Unfortunately, the ‘Tourist Office’ was closed for business and we could not find anyone who seemed prepared to act as a guide. However, seeing the belching steam and yellow sulphur on the volcano as we left, we were not sorry we didn’t get to hike. As well as taking us ashore for supplies, our yellow dinghy was a method of exploring around our anchorages. 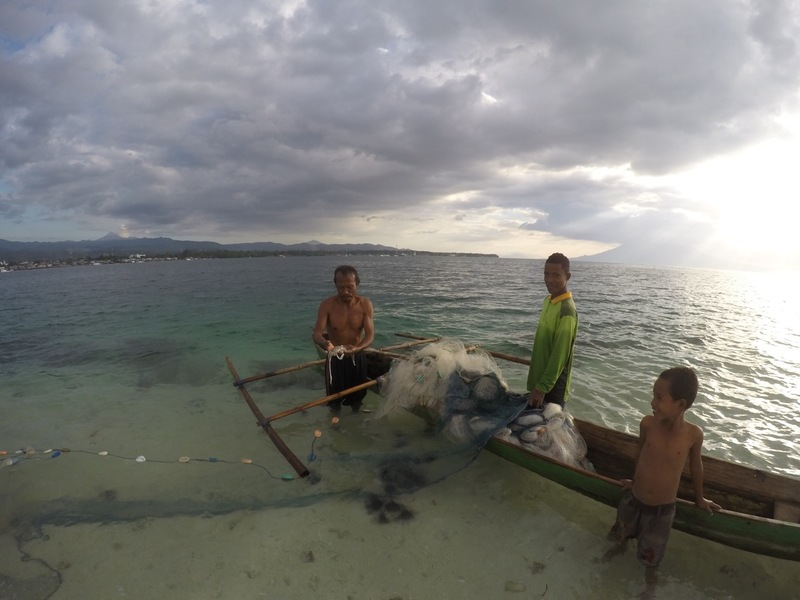 At low tide, the Awalolong Reef exposed its beautiful white sands and a myriad of boats headed out. 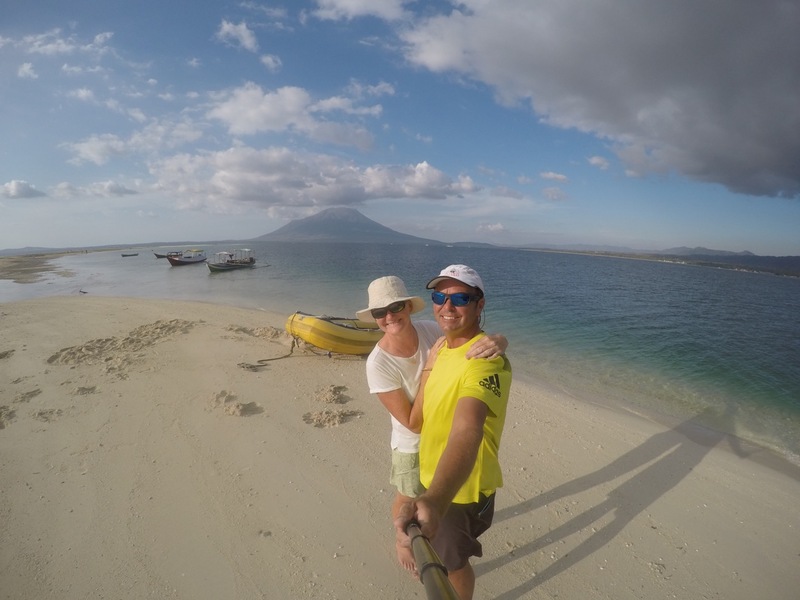 Our Western biased led us to assume they were tourists enjoying the opportunity to photograph the volcanoes from a white sandy beach. Great idea we decided and headed out! 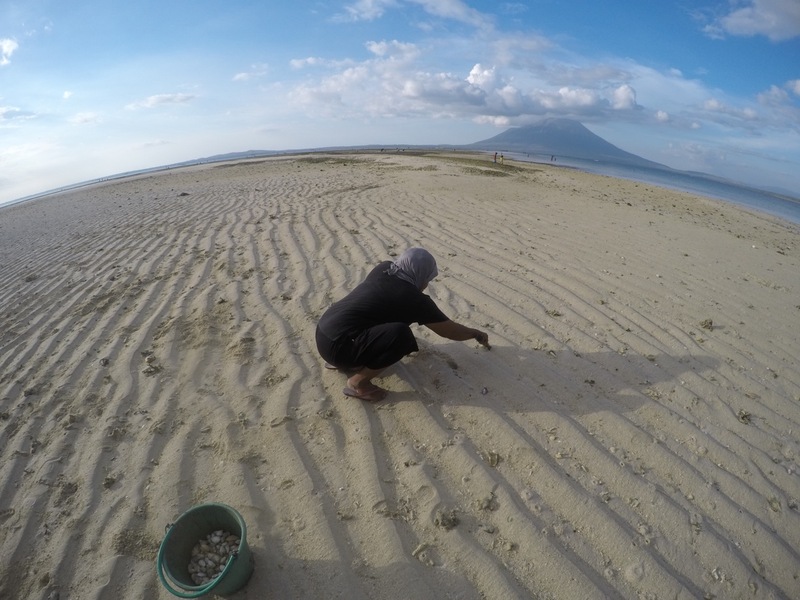 Instead of tourists frolicking around taking selfies, we discovered families digging for shellfish in the sand. A food source with greater guarantee of success than fishing. They caught some cumi cumi (squid). Yum! 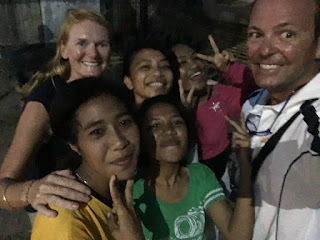 One evening as we were wandering along the main drag, several Year 11 school girls approached us. They were studying for a big English test and asked for our help. 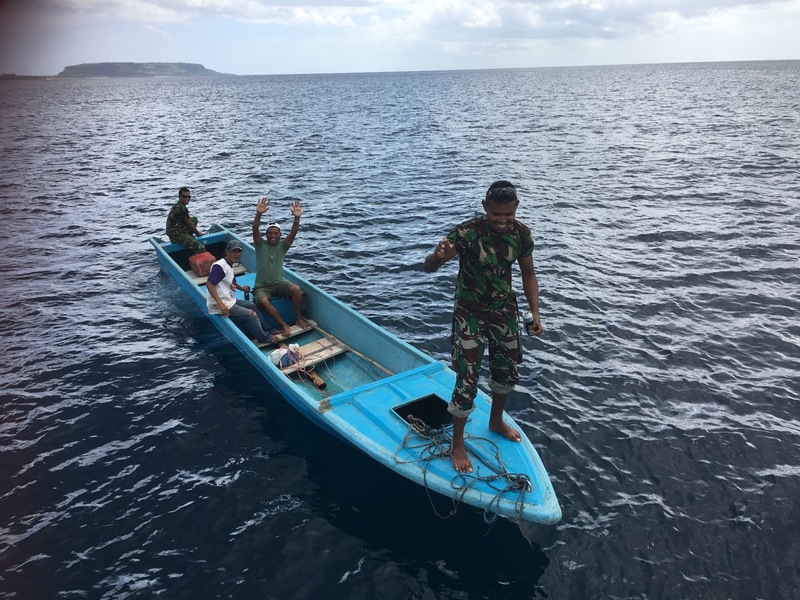 We had a fun time helping them with their language exercises and somehow, we found they had invited themselves to visit the boat after their test the next day. Two of the girls, a sister and a small cousin, along with a big bag of fresh vegetables, duly arrived. We actually had a fabulous time. Sean pulled out his guitar and the ‘egg’ maracas and sang some foot-stomping Johnny Cash and John Denver. The sister knew the words much to the amazement of the younger girls. Unfortunately, Sean couldn’t accommodate the request for ‘modern’ music, which turned out to be Rod Stewart! The weather kept us put for longer than we had planned but gave us the opportunity to catch up on boat chores, refuel and relax. We ate at a wonderful warung each day, the freshest of ikan (fish) and cumi cumi (squid) and she prepared us a number of serves of nasi goreng ayam (chicken fried rice) to save us cooking for a few days. 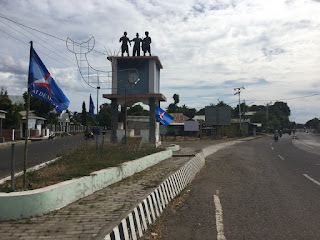 Monument at the main intersection of town. 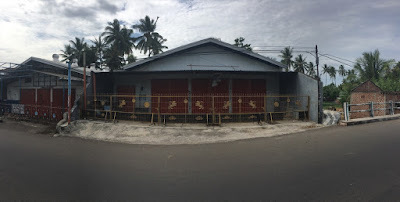 Typical to Indonesia, it was in disrepair and the clock didn't work. Beautiful detail, great location ... and abandoned. Lots of labour, not many machines. Rusty metal roof, thatch walls and satellite dish. Easy to spot the dry goods shops. 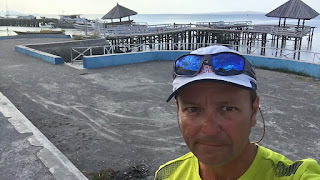 A recently-built wharf that has already fallen into disrepair. The tides leave sandy drying areas and a few surprises. Popeye is in the distance. There was a 'shop' in front of most houses. Having fish for dinner 25 metres from the shore. Fresh. 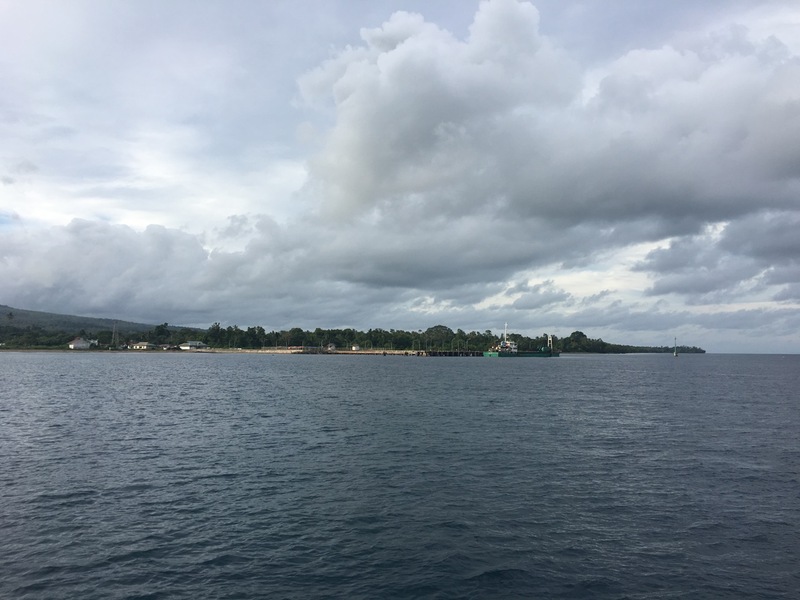 A view of Ile Ape as we sail away. 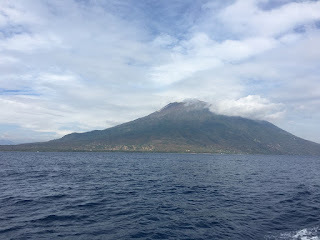 As we sailed away, we got a better look at Ile Ape and the reason why it always appeared to be cloudy/smoke near the summit. Molten sulphur. Yikes! Note from Sean: As my charmed life continues, I got to spend my 52nd birthday on Popeye. Kate even managed to scrounge up a birthday bun with candles. Aren't I lucky? We decided to day sail across the top of Flores without much land-based exploring, as none of the anchorages had any substantial settlements. 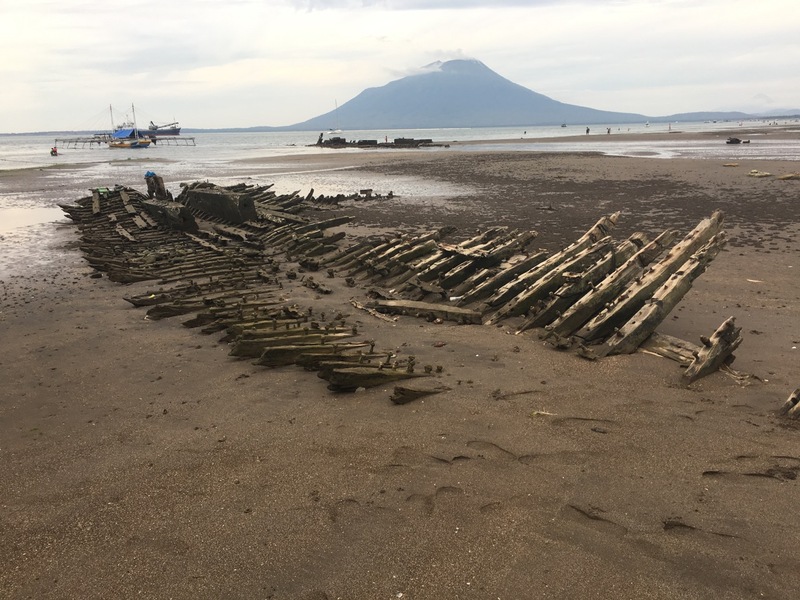 We would head to Lewoleba on the island of Lembata, just enjoying the anchorages overnight. We previously had a couple of gorgeous, but gnarly, anchorages so we were looking forward to tucking in behind Tanjung Gedong, a deep but straightforward anchorage. 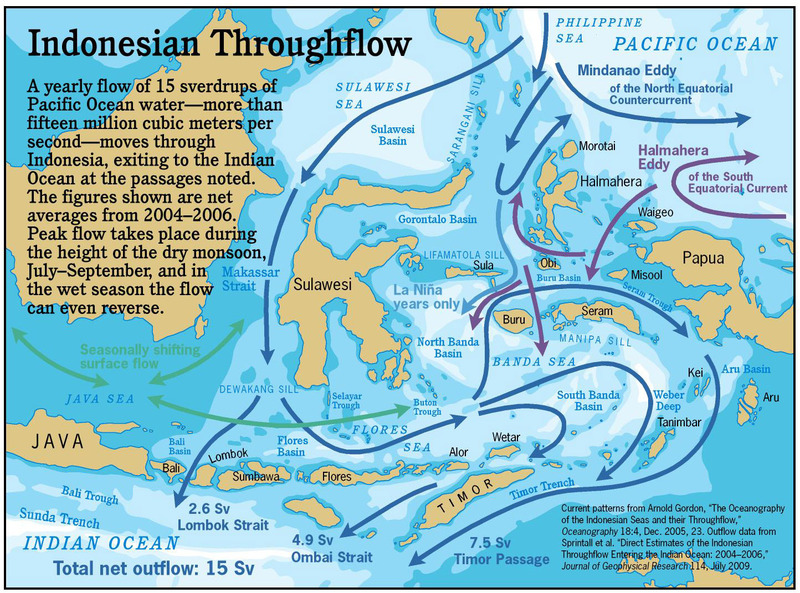 Tanjung means 'point of land' in Bahasa Indonesia. We passed smoking volcanoes, watched pilot whales and dolphins frolic and came SO close to catching on a fishing net that the floats scraped along the side of the boat. We still marvel at the flying fish and just how far offshore fisherman come in their tiny boats. 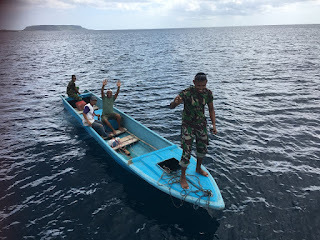 We have also become used to large fishing boats suddenly changing course and coming directly for us (echos of worried friends - "... but what about pirates??") just to wave, say hello and take a photo. We respond by taking our own photos, much to their mirth and merriment! See his net?? Neither did we ... until the last minute. He has a flag up to indicate he has a net out! 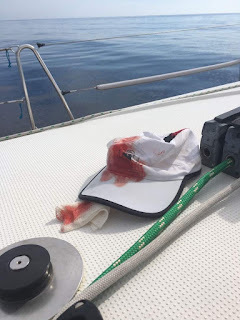 We did have to reset the "Accident-Free Days on Popeye" to zero as Sean was whacked in the head with the jib halyard whilst dowsing the sail. It caused a small head wound that bled and bled and bled (as they do). Sorry Craig, the #4 now sports some lovely new art work ... but we managed to avoid splotches on the teak or coach house. ...and the Popeye cap rinsed out to look like new! 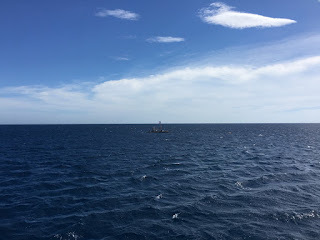 For the first time in our pootle down through the equatorial doldrums, we started to get a reasonably choppy sea. Not of Bass Strait proportions but enough for us to bash into and require clipping on when going forward. Well, perhaps not required but it saved the other having to turn back to pick up a man-overboard. The wind, about 20kn, was bang on the nose so the sails wouldn't be helping - we were having to motor. 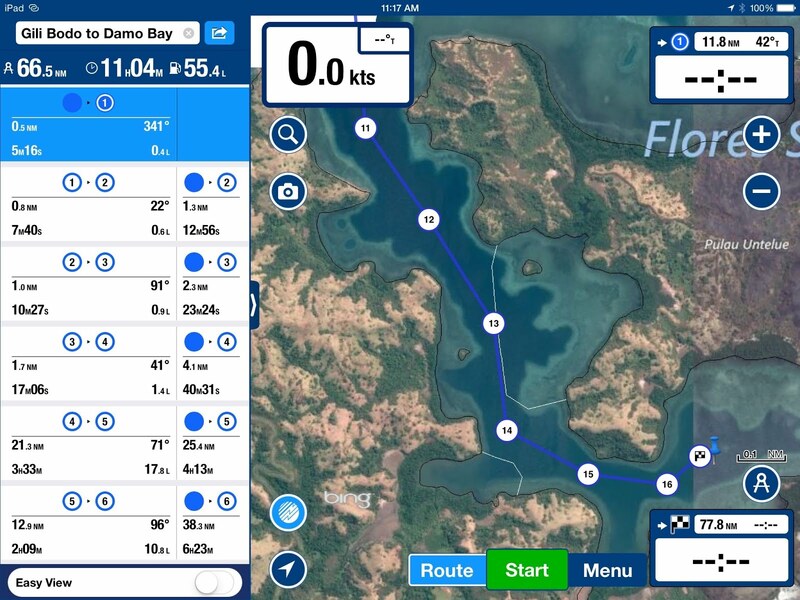 Nothing too extreme but we were happy to be approaching our anchorage ... and a straight-forward one at that. Again, to our delight, there was another yacht in the anchorage. 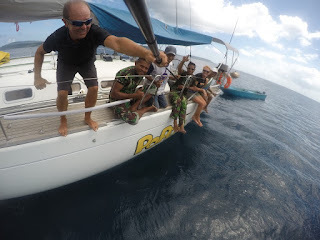 Cool Runnings (have a look at their blog), a Lagoon 400, hailed us on the radio as we approached and offered any assistance with us anchoring. The anchorage, although a lovely sweeping bay, was incredibly deep. We were still in 200m of water as we passed the headland. 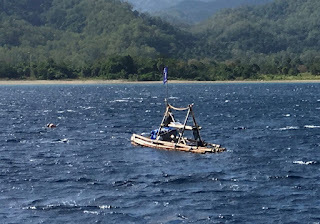 On our second attempt, we managed to hook the anchor - in about 20m. Our new South Aftrican/American friends were on a three-year circumnavigation, having started from Florida and (sensibly) heading west. 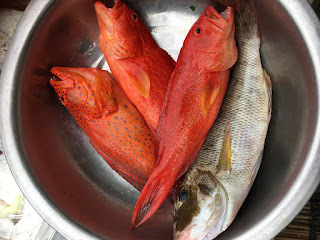 They were quite fresh to the Indonesian experience and had not stopped at many places along the Indonesian archipelago. We were happy to tell them of our good experiences in Labuhan Bajo and Bali. 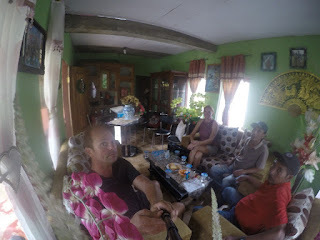 We passed along anchorages we had used (we have the latest edition of a fabulous cruising book for Indonesia that has been published after the Hibberds left home) and advice and contacts for obtaining fuel and provisions. They graciously shared stories of their adventures so far, gave us a tour of their catamaran (much roomier than a cruiser/racer monohull) and offered to happily meet up with us in the future. 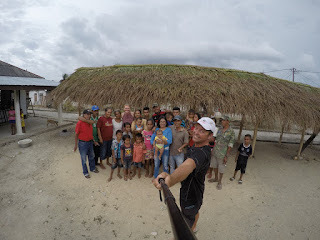 They are a lovely family and we are so impressed by what they are showing their kids about the world. They've come to say hello and check for handouts. Tomorrow, it is off to the next of our provision/fuel stops - Lewoban, on the island of Lembata. As we go further east through Indonesia we enter what are referred to as "The Forgotten Islands." 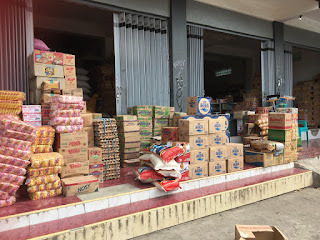 Jakarta, Indonesia's capital, provides very little support to the far reaches of the country with regards to government spending on infrastructure, education (and hence opportunities to learn English) and a transportation system, which limits the far-flung islands' ability to obtain supplies. 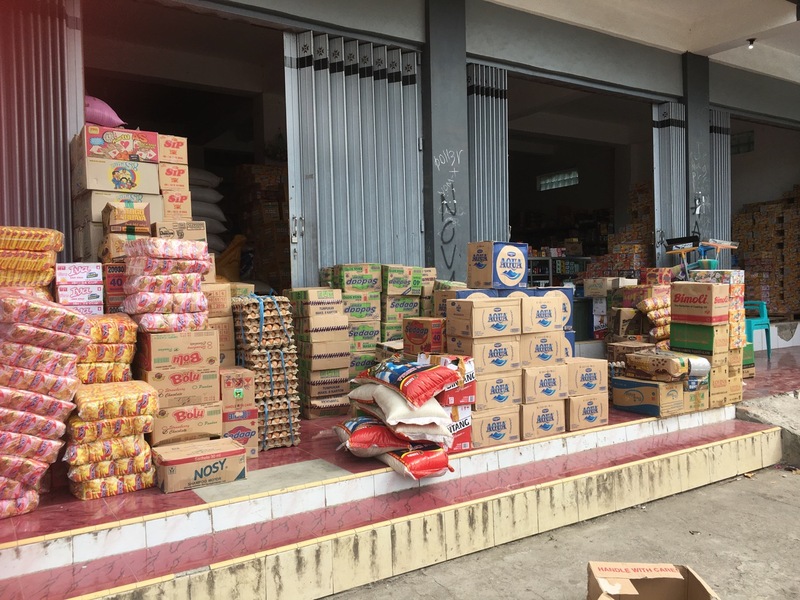 It makes the islands learn to be self-sufficient, but we need to be able to get the essentials, such as enough usable diesel to get to Saumlaki, our Indonesian checkout point.